Robert Vaughan’s 2013 release, Microtones from Červená Barva Press contains two dozen prose poems of varying lengths and a variety of rhythms and structures. From the shortest, just four lines, to the longest, going on two pages; Vaughan’s poems are like songs with a hook that make you want to hear them again. Microtones is like a hand carved box filled with little treasures, a leather album with photographs of people and places you want to know more about, or a double record on vinyl with 24 three minute songs you play over and over. You slide into each poem with so much ease, that, before you know it, you’re off and running. Microtones celebrates the predicaments of the human condition and the ephemeral quality of human relationships, and mourns their passing, while at the same time, still holding hope for the future. 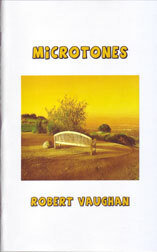 Though Microtones is work from a seasoned author, it is also fresh and exciting new work from a writer just really hitting his stride, an artist who speaks to us, in full, with a vibrant voice, and whom we can expect to hear from again. great review, MGM. gotta love Robert Vaughan. I don’t have his book yet…but it’s on my ever-growing list. Thanks Jules! That list DOES grow longer. I have a stack of books staring me down as we speak. Nice review! I like the way Robert is characterized here as a writer ‘just hitting his stride’. Well put.